Down past the IS mechanism and carefully screwed-down aperture assembly, Aaron and Roger reached the focus element. 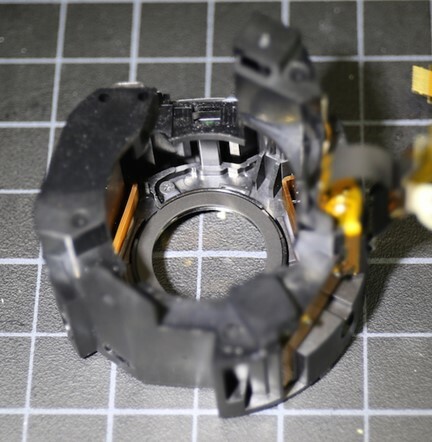 There's a sensor detecting the position of the focus group within the lens barrel then, on the group itself, what appears to be another one to detect the focus element's position within the group's housing. But, wherever the focus element itself is, you can be fairly sure it's not crooked: as Roger points out, the twin linear motors (10 o'clock and 2 o'clock in this image) and the rail along which the focus element moves (12 o'clock) are all broad, flat bars, rather than circular rods, meaning the element shouldn't go askew as it races on its way.